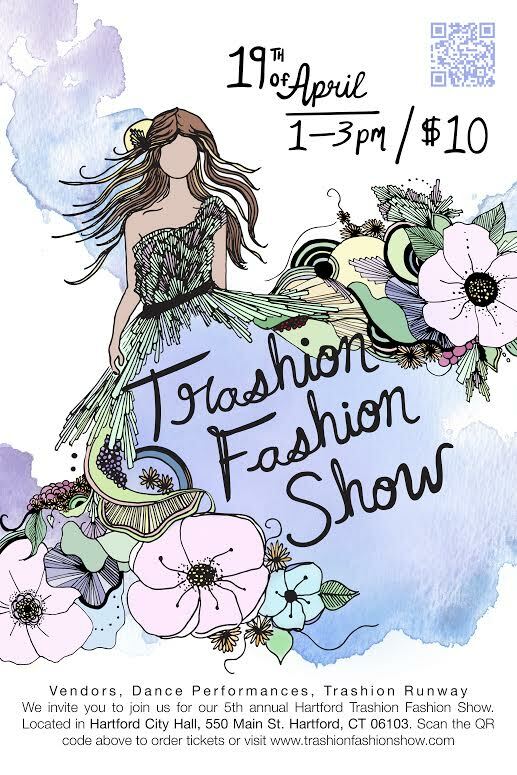 The 5th Trashion Fashion Show is taking place in Hartford on April 19th. This year there will be an Earth Day eco-market with local vendors in Burr Mall just outside of where we are having our fashion show. Doors open at 1pm on April 19th at Hartford City Hall. We have a choreographed runway with models and ballerinas. Designs in our show are made from materials that would otherwise be in the waste stream. Designs are made by professional designers, local artists and students. There will be live music, dance performances and vertical gardens. We are also having a very special event called the Trashion Soiree on April 25th at Hartford City Hall. This is a 21 years of age event with a conscience cocktail hour. We will have models in our past year’s designs mingling with guests. The runway will begin with a special show opener from DFX entertainment. This runway is a curated choreographed runway featuring our favorite designs. Designs in this show are selected based off resourcefulness and innovation. Our events strive to be zero waste and we hope to inspire awareness of global sustainability.